Elite Forces M48 Paracord Survival Bracelet ACU Camo | BUDK.com - Knives & Swords At The Lowest Prices! 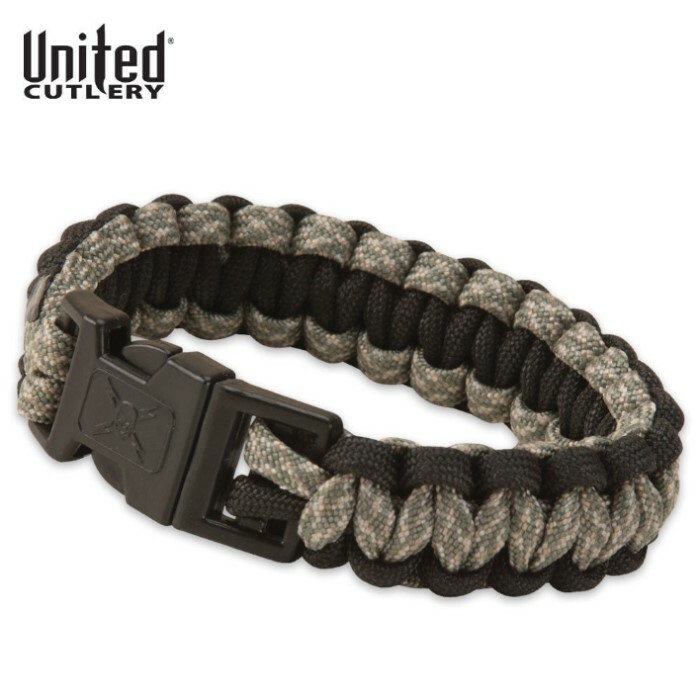 This M48 military paracord survival bracelet from United Cutlery is hand woven from military spec, 300-lb. paracord. Each bracelet offers strong ABS side-release buckles and fits wrists up to 7 to 9" in circumference. The bracelet can be unwound in survival situations to produce more than 9 feet of usable survival cord. It could be used for shelter building, splint building, spear lashing, building animal snares and many other tasks. Absolutely love it. Not only can it be used a described but it also makes an awesome fashion statement. So much so that as a watch collector, I ordered several colors to accessorize with my watches. Watch on the left. Survival bracelet on the right. Thank BudK. You rock!!! Fit great. Great quality .